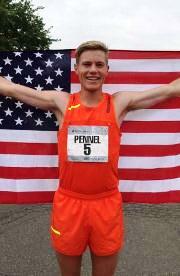 Tyler Pennel is the current U.S. Marathon Champion with his 2014 Twin Cities Marathon victory in his debut marathon that he won by 28 seconds in 2:13:32. In his first half marathon he finished fourth at the 2014 U.S. Half Marathon Championships in 1:01:44 and represented the U.S. at the 2014 World Half Marathon Championships, finishing 33rd in 1:02:20. Tyler has five top 10 U. S. Championship finishes at distances from 10k to the marathon. 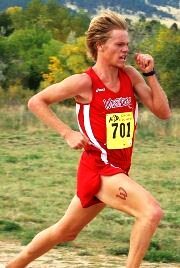 He graduated from Western State College of Colorado in 2012 where he won the NCAA DII 10,000 meters in 2012 and had four NCAA DII runner up finishes in cross country (2011) and track (5,000m in 2009/11/12). Tyler was an 11-time All-American and led the Mountaineers to the 2011 NCAA DII cross country team title. His collegiate times of 13:51 for 5,000m and 28:23 for 10,000m are sixth and second, respectively, all time at Western. Tyler epitomizes the term ‘student-athlete’ and in 2012 was Rocky Mountain Athletic Conference Academic Athlete of the Year and was named to the Capital One Academic All-American 1st Team. At Golden (CO) High School he recorded best times of 4:25 for 1,600 meters and 9:49 at 3,200 meters, both at mile high altitude. His personal best times include: 800m – 1:53.32; 1500m – 3:50.50, (3:43 altitude converted); mile – 4:01.95; 5,000m – 13:40.49; 8k – 22:43; 10,000m – 28:29.71; 12k – 34:37; Half Marathon – 1:01:44; and Marathon – 2:13:32. He is a 2013 Road Runners Club of America Road Scholar. Tyler lives in Lenoir, North Carolina and trains in nearby Blowing Rock with the Zap Fitness team. GCR: Congratulations on your winning the U.S. Championship at the 2013 Twin Cities Marathon. It’s only been five days since the race and with less than a week since winning to reflect, what are your thoughts and emotions after winning your first marathon and in doing it on the national championship stage? TP I’m extremely happy and excited that I was able to go and win the championship, but I’m back in North Carolina at Zap Fitness and right back to work. I had to clean up some rooms as we have a group coming in this weekend. But, I am on a running break and, other than that, am just hanging out. GCR: Are you getting massages, doing ice baths or just some hiking on trails to help your legs recover and loosen up? TP I’ve been going for at least one walk a day, but mostly have been chilling out. I’ve done some things for my website, have gotten organized in some areas and am recovering from the weekend. GCR: Getting back to the Twin Cities Marathon, was it even more gratifying to win a race with a strong lead pack and a negative split where you made a move and pulled away in the final 10k? TP Yes, it was. It was kind of how I envisioned the race would go. I planned to stay relaxed. I thought maybe we would go out a little faster, but the pace was fine. GCR: What was your strategy for the early miles, mid-race and final 10k? TP I wanted to stay relaxed and wait until the hills around 20 or 21 miles to make a move and go for the win. GCR: Scott Smith pushed the pace which broke up the lead pack around 19 or 20 miles and only you were able to match his surge. What was going on in your mind at that point? TP I was just about ready to make my move, but I was going to wait until the water stop at about twenty and a half miles. He made a move a mile earlier, so it kind of worked out well with my plan. GCR: What was the impetus for you to decide to make the move to separate from Scott when there was still a lot of ground left in the race? Were you feeling good and what was that crunch point? Did you sense weakness or did you decide to test him? TP I wasn’t thinking about anyone else really. I was feeling good and decided to go for it. GCR: After you broke away and were in the lead you had to manage several more miles of pacing and seeing how you were feeling. Did you have any moments in the final few miles where you had any muscle twinges or a cramp coming on or where you had to dig deep to maintain your effort and focus? TP I felt pretty good going up the hill around twenty-three miles, but once I got to the top it started getting really hard. I started to worry a little bit that maybe I went too hard too early up the hills. I knew that if I got caught I probably wouldn’t have been able to respond. So I kept pushing. Only in about the last mile did my hamstring start to cramp a little bit, but I don’t think I slowed down much at all because of it. GCR: What was the feeling coming down that last little hill toward the finish? I ran that race in 2003 and it felt like, boom, being shot out of a gun toward the finish line. So how was it pretty much knowing that it was your race and that you could enjoy the last minute or so? TP At the top of hill with about a half mile to go was when I knew I was going to win, that I wasn’t going to be caught and it was nice. I could enjoy the last couple minutes and that will be something I will always remember. GCR: How nice of a family moment was it sharing the race with your parents who I understand were on the lead vehicle? TP They were there the whole time and got to see the whole race. GCR: So few family members, whether a spouse, parent or sibling get to experience that so it must have been exciting for them to see it and to share the emotion right afterwards? TP It was really great. It was fantastic that my coach could get them some tickets on the lead trolley and they were able to watch me win my first national title. GCR: You’ve finished in the top ten of five U.S. Championships and were only five seconds out of winning the 10k championship when you were outkicked this past summer. How exciting was it to not be in the top ten or runner up, but to have a national championship? GCR: You raced some fast half marathons earlier this year with a 1:01:44 at the U.S. Championships and 1:02:20 at the World Championships. What did you and your coach tweak in training over the past six months to prepare mentally and physically to step up to twice the racing distance? TP Really it started last fall when my coach, Pete Rea, and I looked at building up to higher mileage than I had done in the past. Previously, the most I had run was about a hundred or so miles a week. Last fall we bumped that up to 110 or 115 miles a week and I adjusted very well to it. I kept at that all of the way until March, so I ran those good half marathons off of that base. Then I ran track races and focused on 5k and 10k. My training didn’t change too much. It is very much aerobic-based and Lydiard-based. Once the marathon cycle started the workouts basically just got longer. They were very similar. For example, rather than ten mile progression run, it was increased to twelve miles or something like that. GCR: Since you came through the half marathon at Twin Cities five to six minutes slower than when you raced that distance, did you feel very comfortable and almost effortless at that point to where you could have stepped off of the course and not have even been tired? TP That thought actually went through my mind a couple of times. When we went through five miles I thought, ‘This is easy. I’m hardly working at all.’ I definitely felt relaxed through the half marathon. It wasn’t until Sergio Reyes through in a surge at 14 miles and we ran a 4:48 mile that I started to notice over the next couple of miles that things were aching a little more and I was getting a bit tired. GCR: It seems like almost all of the top marathon racers I have interviewed feel that you must feel effortless the first half marathon to 16 miles so that you can respond mentally and physically when moves are made. So it sounds like you were on track with that thought process and it served you well. You raced to win rather than for time. How much faster do you think you could have raced if the early pace had been quicker and you needed to race faster to stay in contention and win? TP It’s hard to say. All through training Pete and I were evaluating my fitness and thought I could run about a 2:12:30 on that course. All of my training was geared to running 2:12:30 and I think I could have run that. If I came through in 66:30 relaxed I should have been able to do the same thing I did and run 66 flat for the last half. Maybe I could have run low 2:12. GCR: To get ready for the 2016 Olympic Trials you just need to be five seconds per mile, or two minutes for the marathon, in each of the next two years to get you under 2:10. Are you and Pete keeping this as part of your thought process? TP I’ve thought about what it will take to make an Olympic team and I think it will be just like the last Olympic Trials. It’s going to take a sub-2:10 effort. I don’t know if the course will be hilly, but it will take that type effort to make the team. There might even be five or six guys who are capable of doing that. GCR: It sounds so simple to improve five seconds a mile each year, but everything you do from long runs to tempos to progression runs to intervals needs to be geared to be a teeny bit faster and, since you are a novice, hopefully you will have a great chance to move to that next level. Is it exciting to look forward to the next two years? TP Since I had such a great debut there is a lot of excitement thinking how much better I can get. GCR: In college you raced cross country and at 5k and 10k. What major changes were made in your training regimen to ramp up for the half marathon distance and now for the full marathon? TP For the most part it was similar. Both are Lydiard based. The difference here at Zap is that my training isn’t quite as much interval based as when I was at Western State. Ever since I’ve gotten here the training hasn’t changed that much. We just do lot of long, aerobic work. GCR: There are several training groups in the U.S. and many other top level runners train solo or with one or two training partners. How did you decide to run for the Reebok Zap Fitness team headquartered in Blowing Rock, North Carolina? TP I had graduated and knew I wanted to run, but I didn’t know exactly where to start. I looked at different groups like Hanson’s, some of the groups in Colorado and Zap Fitness. I came out for a visit to Zap and I really liked the environment here. One thing I knew was that I needed a team to train with and I wanted a coach who could set my training. Those were my big goals and I liked being in the mountains since I’m from Colorado. I was able to find a place that fit what I needed to be successful. GCR: I ran collegiately at nearby Appalachian State University and am very familiar with your training options on trails in Moses Cone Park, on Blue Ridge Parkway roads and surrounding areas. What have you gained mentally and physically from training in and around Blowing Rock? And what are some of your favorite training choices such as running through ‘The Maze’ and repeats around Bass Lake? TP We have a lot of great places to train. We have twenty-five to thirty miles of trails at Moses Cone National Park in the woods where it is hilly and we do intervals around the lake. We do probably 60 per cent of our training runs there. Watauga River Road follows the Watauga River, has good rolling hills and is about three fourths dirt road. We run out at Todd Railroad Grade Road which is an old railroad bed that is paved. We’re at moderate altitude and most of our training is done between 3,500 and 4,000 feet. So we have some benefit from altitude, but when we want we can drive an hour and be fairly close to sea level if we want to hit a hard track session. GCR: You talked about what your average weekly mileage tops out at for a period of base building for a marathon, but how long are your long runs, how many do you do and at what pace or intensity? Do you do steady state long runs, sometimes a fast finish and do you run longer than a marathon? TP We did six marathon specific long runs that were all 20 to 23 miles long. We didn’t run longer than a marathon. My longest run before the marathon race on Sunday was 23 miles. They each focused on different aspects of training for the marathon, but one of the staples we have is to do surges in our long runs. We are assigned a specific amount of time to surge and we take five minutes in between. The long runs get faster and faster and the surges also get faster and faster. One of the things that I think helped immensely is that for our big, long run we did it on the course in Minneapolis. My teammate, Cole, and I went up there for a weekend and ran from the four mile point to the finish. Running up those hills helped a lot because I knew what to expect in the marathon. GCR: Your training, as you’ve noted, is very Lydiard based. Do you do repeat two miles like the Hanson’s team and something like their marathon simulator where they run 26k at marathon pace? TP One of my long runs was that I ran the Virginia Beach Rock ‘n Roll Half Marathon. The first ten miles was at marathon pace and I picked it up the last three miles. We try to do as much as we can at marathon pace and get comfortable with that. GCR: When you’re in your track racing period or during marathon training, to keep top end speed and efficiency, do you drop down and do repeat 200 meters for speed and short hill repeats for speed and power every so often? TP Starting with about five weeks to go before the marathon about every week Pete would have us do eight by 200 meters or eight by 30 seconds at 5k effort. If it was marked out we would be doing them in 32 or 33 seconds. There are other days where he would have us do strides after our run. It wasn’t quite as formal but got our legs moving. GCR: We are getting into the winter training period - what will be your focus in 2015 in terms of increased mileage, what races you will aim for and how many marathons do you expect to put on your racing schedule? TP My upcoming schedule as it looks now is that I am looking to make the U.S. team for World Cross Country. That will be in early February in Boulder, Colorado, so that will be the main focus for the winter. Summer and fall will be focused on running the World Championships Marathon in Beijing because I qualified for that at Twin Cities. I’ll just have that one marathon next year. It comes at a good time as I’ll have plenty of time to recover and to get ready for 2016. GCR: In Beijing, due to the weather, it will probably be more effort based than time based. How do you do running in the heat versus the cool weather? TP I prefer cool weather - the cooler the better. In college when we won our national cross country title as a team it snowed an inch in the thirty minutes we were running. We were absolutely excited about the weather. But I tend to run pretty well in heat. I can’t think of any time I had a terrible race where and I thought it was because of the heat. GCR: In between the 2015 World Cross Country Championships and the 2015 World Championship Marathon do you see yourself stepping down and having a track season where you are working on the 5k and 10k and getting faster on the track? TP Yes, my goal is to step on the track for a few races and to try to go for the World ‘A’ standard in the 10k. If I can get that out of the way I can focus purely on the Olympic Trials Marathon for 2016. But if that doesn’t work out and I don’t make the team I can go back to the track and don’t have to worry about getting that standard. GCR: Your mile PR is 4:01.95 - has it been on your racing bucket list to go sub-4:00 and will you take serious aim in a mile race or two in the summer of 2015? TP Yeah, sub-4:00 has been on the list for a while. I definitely want to do it, but the goal of making the Olympics in 2016 takes precedence. The main goal for the upcoming track season is to get the ‘A’ standard in the 10,000m. It seems like I get a shot or two every track season at that sub-4:00 mile, so hopefully I will get a chance in 2015, but I will be cutting the season a bit short so I can train for the World Champs in August. GCR: You really made your mark on the U.S. distance scene with your 1:01:44 at the 2014 U.S. Half Marathon Championships. What did you do to have this breakthrough, did you surprise yourself a bit when you went that fast or did Pete and you feel you were ready for a sub-1:02? TP It was a little bit surprising for both Pete and I. We had talked about running1:02:20. He said, ‘Let’s go out at 4:45s which is 1:02:15 or 1:02:20 and see where it goes from there.’ Eventually the race got going, I was up near the front, I was feeling good and we were running a little bit quicker than that. I decided to see what happened and it worked out pretty well. GCR: At the World Half Marathon Championships you ran right on that 1:02:20, but finished well back in 33rd place. How big of an eye-opener is it to see how deep the talent is on the world stage? TP I went out a little quick, was on about 1:01 flat pace through 10k and I was in around 33rd place. After that I hardly got passed at all and I hardly passed anyone. I thought some of the runners would be coming back, but no one came back to me. To see all of the talent is incredible. There are so many good runners out there. It’s definitely some place I want to be. I want to be higher up. I thought going in that I could get top twenty. GCR: When I looked at the results, top twenty was low 1:01s and top ten was just over an hour. It is amazing how fast a runner has to go to get top twenty or top ten. Hopefully, the experience will help you to know what to expect, run smarter, pass some people and get adrenaline going in the second half of the race. TP I know if I go back that I can get top twenty, but I’ll have to run a little smarter and hopefully be a little better as well. GCR: How exciting was it to pull on the USA jersey and to represent your country? TP That was really cool. It was the first jersey that I earned. It was definitely something special. U.S. Senior teams don’t come around that often and are very hard to make. To be able to put on the U.S. jersey is definitely an honor that no one should take likely. GCR: You’ve finished in the top ten of U.S. Championships at 10k, 12k, 15k, the half marathon and marathon. Do you have a favorite racing distance and why? TP I don’t know. I like road racing in general. It is well-suited for my style of running. If I can push the pace, like at the 10k championships, I will. The half marathon and marathon tend to suit my strategy well. I don’t have a favorite distance yet. I enjoy all distances and still like going to the track. I have some goals I want to hit before I hang up the spikes and focus solely on the roads. GCR: Would you say that the reason you may not have a favorite distance yet is because of your limited experience? TP I’ve only run two half marathons and one marathon, so the lack of experience in those distances does make it hard to answer. GCR: Let’s go back to you formative running years. In cross country at the Colorado State 4A meet you finished 116th, 47th and 35th which hardly is an indicator of your level of racing now. Were you running with a good group of guys, was your coach good, were you training well or not anywhere near your potential? TP I started running right before my sophomore year of high school and I was definitely just out there enjoying it. All throughout my high school career my team wasn’t that good so I was often training by myself. My first year and a half I was out there enjoying it and nowhere near my potential. I clearly had some talent and how quickly I progressed showed it was there. The winter of my junior year I found a running group based out of a rival high school that was a club team I trained with in my off season. That helped a lot. My last year of high school I trained fairly well and showed a lot more potential than I had shown before. My last year in cross country I didn’t have a good race at State. I was looking for a top five finish and I kind of blew up. GCR: Similarly, in high school in track you raced at 1,600 meters and 3,200 meters, but at the 2006 Colorado State 4A meet finished just 14th in 4:36.74 and 5th in 9:50.12. Were you racing at altitude and how do you sum up those race results? TP Those performances were at altitude in the Denver metropolitan area. So they were a little bit stronger than they look on paper. I wasn’t a blue chip talent coming out of high school. In high school I struggled mentally in getting ready for races. I would get nervous like in cross country where I just cramped up and didn’t run very well. Not to make more and more excuses, but in the 1,600 meters at State I fell. I was looking for a high finish as I had run 4:25 and was ranked third or fourth. I was looking for higher results, but it didn’t happen. GCR: You mentioned that you ran stronger in cross country before State and that 4:25 time for 1,600 meters. What are some of your high school running highlights that stand out as memorable races? TP One was our conference meet in track my senior year. I got second place in the 1,600 meters and came back with a PR to win the 3,200 meters. That is a meet I’ve always remembered. It was cool to do that and probably the biggest race I won in high school. GCR: Who was your coach and what did he do to set your running foundation? TP My coach was Greg Holland who was a history and geography teacher at the school. We had pretty good training. It was more interval-based than other coaches I’ve had since then. I think that helped. Mostly, he realized that I wanted to be good and he tried to hold me back. I would run way too fast and work out too hard, so mostly he was holding me back, realizing that if I didn’t work out too hard I would race better. GCR: As you noted, you weren’t a blue-chipper, but you went to Western Colorado State where you got faster by leaps and bounds, and were a DII All-American multiple times. Did your training change much in college and what did your collegiate coach do to help you improve and adjust to college running and life? GCR: You mentioned winning that 2011 NCAA DII Cross Country team title on that snowy day. How much more special was it to share a national title with your team rather than to win one individually? TP There were five or six years at Western of wanting that title. I’d been there on three teams previously that had gotten second place at nationals. It was always our goal to win. It was great. My teammate actually won the race – we went one-two. More than just winning, we went out and ran very well. We finished 1-2-5-7-13. Looking at that score and what we did that day we realized we were on of the best Western teams ever and one of the best Division II teams ever. GCR: That was a dominating performance to say the least. It’s interesting how you moved up from second to first as a team because you did something similar in track. You won the NCAA Division II 10,000m title in 2012 after three second place finishes. How close were some of your runner up finishes? TP All of those second place finishes were under three seconds. One of them was three-tenths of a second. They were all in the 5k. Moving up to the 10k helped as I found a distance that was better suited for me. GCR: Where did you make your move and what was the crunch point that helped you to take down that national title? TP I made my move at 600 meters to go. In previous national championships I’d gone at 1,000 meters and I’d gone at 200 meters and got second place. So I split the difference to see where it went. With a mile to go I went to the front and started picking up the pace a little bit, so that is where I started pushing the pace. With 600 meters left I just took off. GCR: Who are some of your favorite competitors from high school, college and currently at the professional level for their toughness or ability to push you to another level? TP In high school in my district there was Kevin Williams who went to Footlocker Finals two or three times. He ended up going to college at Oklahoma. In high school we would just race. At a little triangular meet there would be Kevin and me duking it out for the win. We were always pushing each other. He was a couple years younger than me so I had the thought, ‘I can’t let this sophomore beat me.’ In college Aaron Braun, Brian Medigovich of Adams State and a lot of other Adams State guys since we raced them a lot. I was always second or third at Conference to one or more of those guys. We would really just push each other. In the pros Aaron Braun is still one of those guys I race a lot. Lately it’s been Christo Landry. He’s been racing really well and is one of those guys who kind of has a target on his back. I get that feeling that I want to go out and beat him. GCR: You were honored in 2012 by Sports Illustrated magazine in their weekly ‘Faces in the Crowd’ feature. Is this something you followed through the years and was it cool to be recognized by SI? TP I didn’t follow Sports Illustrated very much, but a few years before my coach had been honored in ‘Faces in the Crowd’ as she was the first female coach to lead a male team to an NCAA title. That was pretty cool for me to be in SI as I got recognized by quite a few people from that. GCR: It tends to go the other way in coaching with more women getting coached by men instead of vice-versa. What did your coach, Jen Michel, bring to the table that was different and helpful that most men don’t get to experience? TP She helped us look at running from a different perspective. Maybe that there was more emotion and that it wasn’t all numbers. It was more how you feel when running which is oftentimes very important as we run by how we feel rather than by numbers. Maybe your coach tells you to hit mile repeats at a certain pace but you feel terrible and you actually back off which is better for you. She brought another outlook than that of a male coach. GCR: With people I coach I try to separate the practices and races into segments where the first third to half is pretty effortless, then you get to the middle part where you run with good form and pay more attention but you are saving yourself for that last part when you are starting to break down so that you can engage mentally. I try to replicate in tempos, long runs and intervals to have that same effort-based approach. There are times we wish to hit, but effort overrides times. It sounds like she helped you with that quite a bit. TP Yes, she was similar to my high school coach in that her job was to hold me back. I was hurt a lot in college because I was overtraining, working too hard in workouts and trying to race in workouts. I was trying to do everything I could do to get better and it took a couple of injury-ridden years for me to figure out that sometimes doing less is better. I realized that if I could be hurt for three months, what was the point of doing this now? I started doing less, not getting hurt and then kept getting better. 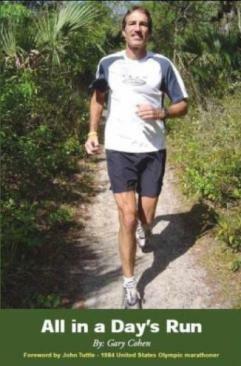 GCR: When I interviewed Keith Brantley a few years ago and asked him what each of his coaches did most to help him to improve, his professional coach, who he worked with all 16 years as a pro, really got him to realize that rest and recovery is training. And Keith said capital ‘IS.’ Not that it was recovery from training, but it IS training, whether it was a slow run or off day. He said he experienced some of what you did and that this helped him to move to another level. He was a blue-chipper out of high school, but in the same pattern as you, so it sounds like you are on track like Keith was. TP Yes, I would say that is something I learned and do now. GCR: You’re in your mid-twenties now. What are your future competitive goals and, if finances and your health allow, for how long do you expect to compete? TP I hope to do this as long as I can. I’d like to do it maybe the next ten years which would take me through 2024. Maybe I can still be making Olympic Trials and still be running very well. As long as it is financially feasible and I physically can, I’d like to keep doing it. GCR: You’ve got your own running website now. Have you given much thought to what you need to do to develop your brand so that you can stay involved in the sport as a coach or speaker or in some other fashion once your competitive days have ended? TP That is exactly it. In college we don’t know much about professional running. We know it’s out there and maybe we ca do it, but we don’t realize what it takes to do that, what it takes to get a sponsor and what to do to build your own brand. There are a lot of good runners out there who kind of hole up, come out and race and then go back. To really be successful you have to put yourself out there and create a certain image of yourself. GCR: I’ve seen some of the runners do that well. One of your peers who comes to mind is Tyler McCandless who has a good relationship with Newton and a good relationship with some of the races he’s won so that even when he isn’t racing they bring him back as they have developed this association. People like that who are role models and peers are probably good to talk to. TP Tyler does a great job of putting himself out there and doing very good things for the running community and people up where he lives in Boulder. He sets a good example. GCR: When you ran in high school you were trying to find your way in training and racing. What advice do you have for younger runners to improve consistency, minimize injuries and reach their potential? TP The biggest thing to get better is to stay injury-free. Whatever you can do to stay injury-free will benefit you in the long run. It’s hard because I had to learn the hard way that you can’t go out and hammer every day. You have to take rest and recovery days. So you have to learn how to recover from every run and make sure every run has a purpose. Sometimes that purpose isn’t to run fast, but to recover. GCR: Reflect on when you speak to groups about the major lessons you have learned during your life from working to achieve academically and athletically, the discipline of running, the patience of training many years with a goal, and coping with adversity that can help them to succeed. What key advice do you give them that you can share with my readers? TP Stay passionate if you love the sport and you love running. Stay passionate and everything will follow. Realize what you can do and what your potential is, and then work to get there.